With 2.3 million students in higher education at 114 institutions across the country, France is a top choice for students from around the world. France makes major investments in research and universities and this is reflected in the quality and breadth of their programmes. With low tuition fees being a big draw, an attractive life-style and many cultural facilities, France attracts well over a quarter-of-a-million foreign students each year. With its overseas departments and territories it is even possible to attend a French university in the Caribbean or Polynesia French schools and universities grade on a scale from 0 to 20. A pass mark is 10/20 to 12/20, good is 14/20 to 16/20. Over sixteen is très bien which is a very hard mark to obtain. Many French universities make less use of computers than is common elsewhere. Taking down hand-written notes is still common. Teachers place a great deal of emphasis on the neatness and correctness of grammar, spelling and punctuation, and even using the correct type of paper, as well as the actual content. Work is often required to be hand-written. France has a wide range of institutions offering tertiary education. The state operates the university system, but there are also private universities run by the churches, as well as several private international schools such as the American University of Paris. State Universities are found in all the larger cities and towns. Because of a policy of equal access, there are no selective admission policies at state universities and they are open to all students holding a baccalauréat certificate from the lycées – the highest level of secondary education. Similar are the more specialized technical universities, which are chiefly engineering schools – for example the Arts et Métiers ParisTech. There are also more specialized technical universities such as: Instituts universitaires de technologie (IUT), which are University-level technology schools; Instituts universitaires professionnels (IUP), professional schools; Instituts universitaires de formation des maîtres (IUFM), teacher training institutes; and some other specialized schools. All these usually have a variety of further entrance requirements beyond the baccalauréat. In addition there are the Grandes écoles. These are public universities with strict admission policies based on national rankings in competitive examinations (concours) set by the schools themselves. Some of these schools are the most famous and prestigious educational institutes in France. Grandes écoles are often small, with only a few hundred students and many specialize in single fields of study. Almost all top civil servants and members of the political class in France are graduates of the various Grandes écoles. The normal route for entry into Grandes écoles is through Classes préparatoires aux grandes écoles (CPGE), however a small number take students directly from the baccalauréat..
CPGE studies are usually for two years, but students may also use the first two years of a university degree programme as an equivalent. Entry into the Grandes écoles for a full programme further requires students to take the concours exams, which are held in spring. Non-EU students can obtain a special visa, the visa provisoire, once the school has accepted you for the entrance exam. This allows you to then stay in France over the summer while waiting to be accepted, rather than having to return home. However, only a very small number of students succeed in obtaining a place, as these schools accept just a few students each year. Classes in French schools are held primarily in French. Many Universities do however have departments offering one or two year programmes in French as a foreign language to bring students up to a fluency in French which will allow them to enter a degree or diploma programme. 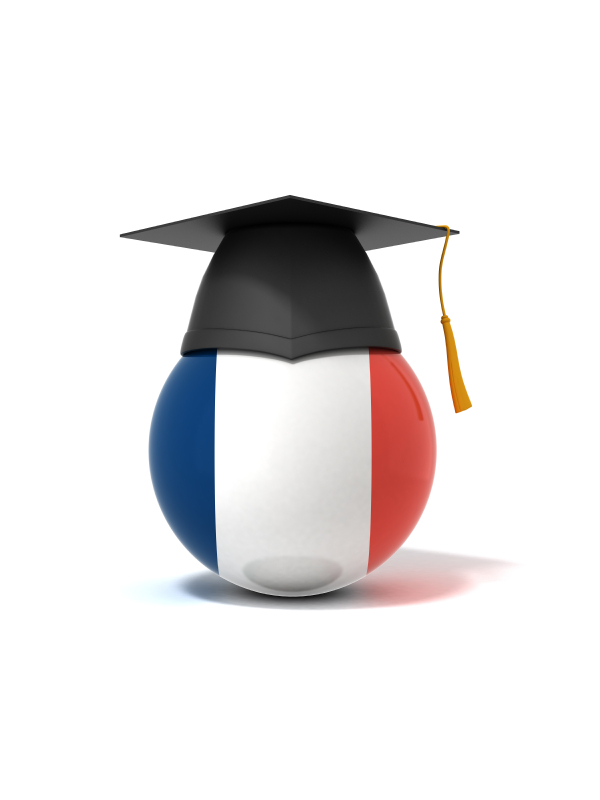 French Universities offer diplomas, while only the State itself awards degrees. There is a gradual move towards the more normal degree system with the state expanding its field of degrees, but most institutions still offer a complex mix of diplomas, depending on the field of study. Many diplomas still do not have equivalent degree recognition. These are the basic degrees for standard subjects at entry level. They are also offered in medicine, midwifery, pharmacy, dentistry, architecture and military studies. This is the more normal degree in most fields, also offered for specialities in medicine, midwifery, pharmacy and dentistry. There is also a masters in accountancy. It is also the normal qualification from the specialized schools and grandes écoles who offer four or five-year diplomas, such as in architecture, engineering, art, music, military studies, political studies and for veterinarians. These are offered in most fields, including art. The great majority of French programmes at all levels include a one-year relevant work-placement, in France or overseas, called le stage. More prestigious institutions often work in conjunction with overseas universities to offer exchange programmes during le stage. So a way to spend a year studying in France at a top school is to enrol in such a programme at a university in your own country.